We get questions all the time about wedding ceremony music! What ceremony songs to choose, how long should they last, how much does it cost, should it be modern or classical? So today we’re going to be looking over all of it: the art of planning wedding ceremony music. LIVE WEDDING CEREMONY MUSIC OR PRE-RECORDED? One of the first choices to make with planning ceremony music is whether to use live music or pre-recorded music (from an iPod or something like that). Most of the time, people go with live music for their ceremony. Live music adds a little bit more of a ‘custom’ feel to a ceremony, as well as an intimate one. Live music will make anything feel a little bit classier and elegant, and a ceremony is no different! That being said, it’s not unusual at all to use pre-recorded music for a ceremony. Sometimes a couple loves a certain arrangement of a song, or a certain singer’s performance. In that case, it’s a great idea to choose pre-recorded music so that you can get exactly what you want when you’re walking down the aisle! WHAT KIND OF MUSICIANS SHOULD I USE FOR THE CEREMONY? If you choose to go with live music, the next question (even before picking your songs) will be how many musicians you should use in the ceremony. The most common number here is anywhere from 1-4 musicians. Any number over that tends to make the music a little too loud for such an intimate part of your wedding, and might overwhelm the moment. So basically for a smaller, intimate setting, usually one instrument will do fine. A single acoustic guitar or piano, or even a harp or cello. That will sound nice, quiet, but really pretty at the same time! 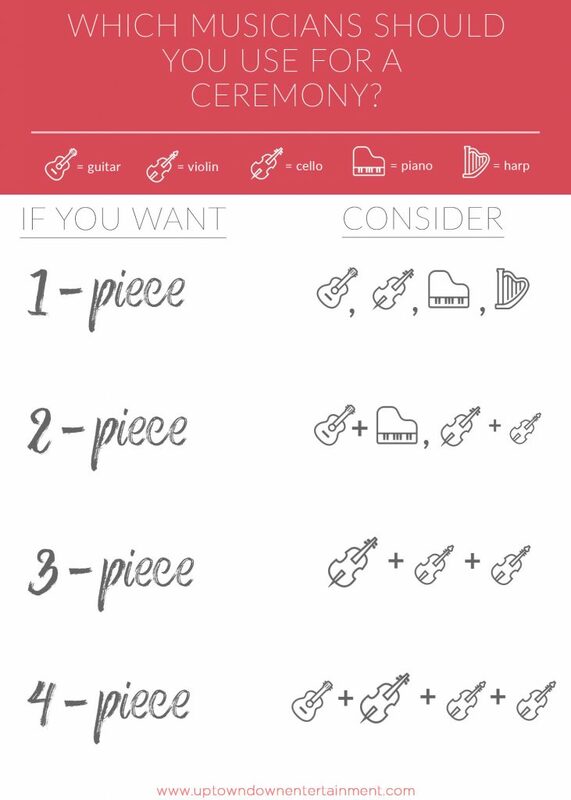 For a two-piece, an acoustic guitar + piano combo or a violin + cello is a popular choice. For three-pieces, I’d recommend a string trio. It’s a more classic vibe, but it’s also a very CLASSY vibe, and will add a movie-quality to your ceremony. Finally for the four-piece setup, I’d go either string quartet (3 violins and a cello) or the aforementioned trio with an acoustic guitar. Probably best to save this one for slightly larger rooms too- all those strings can add up in volume! HOW MANY SONGS DO I NEED? In most weddings ceremonies, you’ll have three songs. You can technically use the same song for the bridal party and the bride, but most people will use a different one! You can also add songs for parents entrance/grandparents entrance- really anything! But usually we’ll just see those 2 being used. 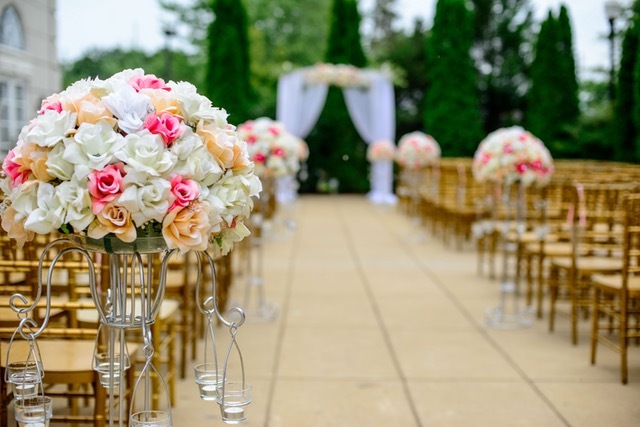 9 times out of 10, whether you choose modern ceremony songs or classical ceremony songs, they’re going to be played classical-style, i.e. with a stringed instrument or a piano. So that might provide a little bit of comfort- whether you pick a classically-styled version of a new pop song or an actual classical song like the Bridal March, it will still probably sound pretty classic! Usually we advise our couples to mimic the overall theme of their wedding. If you’re going for a more upscale vibe like the Great Gatsby, with lots of horns and black ties, a classical approach might be perfect. If your wedding is a little more modern, laid back and loose, or you want to stand out a little, then picking modern music set against a string trio could be VERY cool. HOW MUCH SHOULD CEREMONY MUSICIANS COST? In terms of cost, you can usually expect to pay about $125-200 per local musician for a ceremony. That would put a duo around $250-400, or a trio around $375 on the lower range or $600 on the upper range. That usually covers everything too- learning the songs, travel, set up, performance (usually 4-5 songs, or about 30 mins), and tear down. WHAT SONGS SHOULD I PICK?! This question is obviously VERY subjective, but there a few guidelines we can recommend. Usually a couple’s ‘First Dance’ song will be the one that means something significant to their relationship, or one they both really like. Your ceremony music, on the other hand, might be more symbolic- since people usually don’t have a singer for the ceremony, feel free to get your metaphors on! Also, you’ll probably want to go with a happy, joyful song- you ARE walking down the aisle to get married! And these songs also represent the start of the party- let’s set the tone! Especially the recessional- guests are excited to get to the food and the dance floor, so here’s a great place to build a little excitement. If you’re still a little stuck, here’s a list of songs that we see a lot used for ceremonies, in no particular order. Hopefully this gives you some ideas for what to do and what songs to pick for your ceremony! 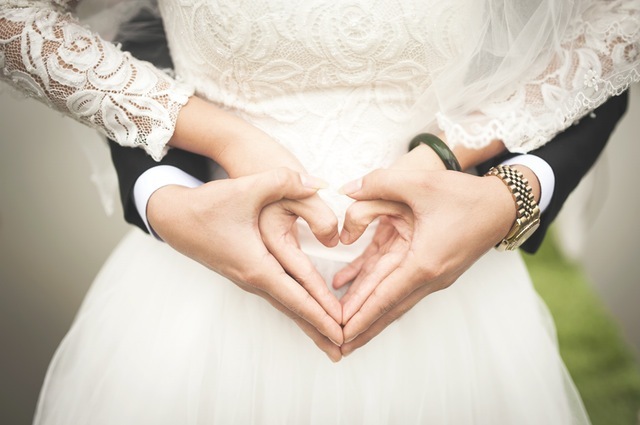 If you want to learn more about some of our ceremony packages, click here to reach out to us and we would absolutely love to help!